When it was redesigned for 2011, Kia’s midsize Optima established a trend toward sedans that stand out in styling, unlike the often-dowdy four-doors of the past. Reworked again for 2016, the Eurostyled Optima enhanced that perception. Little has changed for the 2018 model year, except for adding a sportier-looking Optima S trim level, at a particularly tempting price. In addition, several valuable active-safety features are now standard or available for more models. All Optimas now have blind-spot monitoring with rear cross-traffic alert, plus rear parking assistance. A rearview camera also is standard. Base engine is a 2.4-liter four-cylinder with direct injection, standard in LX, EX, and new S trim levels. Developing 185-horsepower and 178 pound-feet of torque, it works with a 6-speed automatic transmission. Optional on the LX is a more fuel-efficient 1.6-liter turbo, rated at 178 horsepower and 195 pound-feet of torque, mating with a 7-speed dual-clutch automatic transmission. 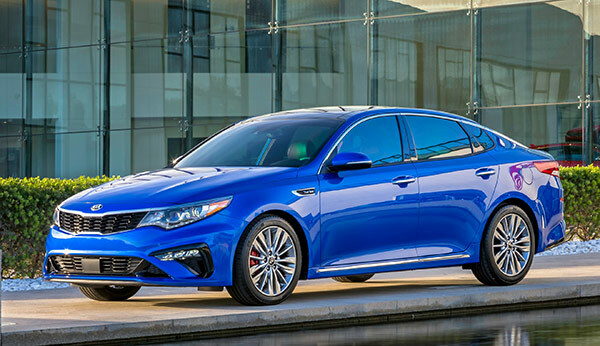 In Optima SX trim, a 2.0-liter turbo produces 245 horsepower and 260 pound-feet, driving a 6-speed automatic. In the Optima Hybrid, a 154-horsepower, 2.0-liter four-cylinder gasoline engine is coupled to an electric motor and 1.62-kWh lithium-polymer battery pack, achieving a combined fuel-economy estimate of 42 mpg. Total output from the Hybrid powertrain is 192 horsepower. The Hybrid can travel short distances, at low speed, on battery power alone. The Plug-in Hybrid, which can be recharged at an electrical outlet, couples the same 2.0-liter engine to a stronger (9.8-kWh) battery and electric motor. Combined output, at 202 horsepower, is slightly higher than the regular Hybrid. Weighing about 250 pounds more than the Optima Hybrid, the Plug-in can travel up to 27 miles on battery power alone. It’s EPA-rated at 103 MPGe (equivalent), or 40 mpg Combined when running on gasoline. All Optimas have front-wheel drive. Each promises comfort and satisfying ride/handling qualities, though none qualify as sporty in nature. The new Optima S looks a bit more sporty, with its own front bumper, decklid spoiler, and 17-inch wheels. In addition to greater availability of advanced safety features, led by automatic emergency braking, Optima has earned top crash-test ratings. The Insurance Institute for Highway Safety named the 2017 Optima a Top Safety Pick+, after it earned top Good scores on every crash test, and also for headlights. The National Highway Traffic Safety Administration gave the 2017 Optima a five-star rating overall, and in each crash-test conducted. LX 2.4 ($22,500) comes with the 2.4-liter engine and 6-speed automatic, cloth upholstery, remote keyless entry, Bluetooth connectivity, a rearview camera, 16-inch wheels, and a 7.0-inch touchscreen with Apple CarPlay and Android Auto compatibility. (Prices are MSRP and do not include destination charge. LX 1.6T ($24,300) substitutes the 1.6-liter turbo engine and 7-speed dual-clutch transmission. S 2.4 ($23,500) gets the 2.4-liter engine and 6-speed automatic, adding cloth/leather upholstery, 17-inch wheels, unique rear spoiler, and 10-way power driver’s seat. Options include a panoramic sunroof. EX 2.4 ($25,600) adds leather seat upholstery, heated front seats, dual-zone climate control, pushbutton start, and woodgrain trim. Active-safety features are optional. SX 2.0T ($30,500) moves up to the 2.0-liter turbo, 18-inch wheels, panoramic sunroof, ventilated power front seats, dual chrome exhaust tips, glossy black trim, foglamps, and LED headlights. Hybrid Premium ($25,995) includes cloth seat upholstery, remote keyless entry, dual-zone climate control, satellite radio, Bluetooth connectivity, leather-wrapped steering wheel and shift knob, 16-inch alloy wheels, and a 7.0-inch touchscreen. Hybrid EX ($30,990) adds 17-inch wheels, an 8.0-inch touchscreen with navigation, 10-speaker Harman Kardon audio, leather seat trim, power driver’s seat, heated front seats and steering wheel, and power-folding mirrors. Plug-in Hybrid EX ($35,210) is equipped similar to Hybrid EX. Active-safety features come in an optional Technology Package. Visually, every Optima, including the base model, qualifies as handsome and distinctive, with an appealing profile. Viewed from the side, the Optima looks sufficiently stretched-out to give it almost the look of a sporty rear-drive model. The Optima isn’t as revolutionary as it used to be, but curves still run rampant on the shapely body. Though highlighted by a coupe-like roofline, it’s not angled steeply enough to threaten headroom. Except for some small badges on front fenders, and a specific grille, Hybrid and Plug-in Hybrid models differ little from gas-engine Optimas. Unlike some competitive midsize sedans, whose base versions seem a bit cheap, the Optima feels substantial even in base LX trim. Spacious and nicely-appointed, the cabin is sensible and practical, yet attractive. Though comfortable, front seats are lower than some, but promise space for long-legged passengers. Deep side bolstering provides fine support. Most back-seat passengers get sufficient head clearance. Six-footers are likely to be satisfied, though taller folks might feel limited by the sloping roof. Wide rear doors ease entry/exit. Interior designers extended the Optima’s dashboard forward as well as into corners, which helps visibility. Dials, buttons and controls are easy to understand and use, as is the infotainment interface. Excellent fit and finish affirms Kia’s recent efforts to rise from its early role as a low-budget choice, closer to a premium brand. Occupants can anticipate a quite ride. Steps have been taken at the windshield, front windows, body panels, and dashboard to suppress any engine thrum and other unwanted noise. SX trim benefits even more from bountiful sound-deadening materials. So do the Hybrid sedans, which are even quieter. At 15.9 cubic feet, trunk space is about average for a midsize sedan. Split rear seatbacks fold down when extra space is needed. Hybrid trunks are less roomy: 13.4 cubic feet in the regular version, and only 9.8 in the Plug-in Hybrid. Mannerly on the road, the Optima yields a comfortable, composed ride. Handling is competent and nicely balanced, if short of sporty. Steering feels crisp when turning and sharp on curvy roads. Body lean is noticeable in quick turns, but appropriate for the midsize-sedan class. Most buyers should be satisfied with the smooth-running 2.4-liter engine and 6-speed automatic, though a hard push on the gas pedal may be needed when passing. Torque output peaks around 4,000 rpm. Downshifting becomes necessary on steep grades in mountainous terrain. The optional 1.6-liter turbo responds more promptly, with greater efficiency, but performance is impeded by the indecisive dual-clutch transmission. Lacking refinement, it tends to lurch through the seven gear ratios. Greater driving enjoyment comes from the 2.0-liter turbo in the top SX trim level. Downshifts are prompt, and engine output peaks at a low 1,350 rpm. Paddle shifters provide best control over the 6-speed automatic. Vibrations from the 2.0-liter are subdued by abundant sound-deadening materials. All Optimas have three selectable drive modes, Eco, Sport, and Normal, which alter throttle response and transmission operation. Most of the time, Normal feels best. Optima Hybrids also ride smoothly, coping with rough roads better than a gas-engine model. Hybrid power is sufficient, despite the additional weight of the battery pack. The electric motor also smooths gearchanges from the automatic transmission. Unlike some competitors, the Optima Hybrid won’t lock in EV mode. Kia was among the first automakers to limit its midsize lineup to four-cylinder engines, but fuel economy trails some rivals. The base LX 2.4-liter has been EPA-rated at 25/36 mpg City/Highway, or 29 mpg Combined. In EX trim, the 2.4-liter drops to 24/34 mpg City/Highway, or 28 mpg Combined. The 1.6-liter turbo is estimated at 28/37 mpg City/Highway, or 31 mpg Combined, while the 2.0-liter turbo is far less thrifty, at 22/31/25 mpg. The Hybrid is EPA-rated at 39/46 mpg City/Highway, or 42 mpg Combined. Fuel-economy ratings for 2018 models have not yet been announced. Kia offers quite a lot in a midsize sedan. Value is still a strong factor, but Optimas also offer handsomely distinctive design, a comfortable ride, and ample features. Active-safety equipment is available, though most is optional only for upper trim levels. No Optima feels cheap in any way, including the base model. Some Optimas approach premium status, with a premium price.